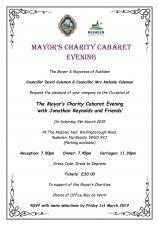 The Mayor of Rushden, Cllr David Coleman, would like to welcome you to his Charity Cabaret Evening with 'Jonathan Reynolds and Friends', in support of the Mayor's Charities. Tickets £30.00, to include a 3 course dinner. RVSP with menu selections by Friday 1st March to the Mayor's Secretary, Rushden Town Council, Rushden Hall, Hall Park, Rushden, Northants, NN10 9NG. Rushden and Higham Ferrers Town Councils are pleased to launch a 5k social run across Rushden and Higham Ferrers on Sunday 24th March at 9am. 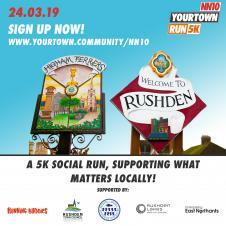 The NN10 Rushden to Higham Ferrers 5k starts and finishes at Rushden Station and Transport Museum and its aims are to create a strong sense of community by attracting a cross section of local people joining in and running together socially. The Town Councils have ...partnered with Rushden Lakes, East Northamptonshire Council, and a local running group, Running Buddies to bring the 5k run together. Local people are invited to join others to raise funds/awareness for two important local causes, Rushden Railway Heritage & Community Space and Higham Ferrers Community Library Group. HTML5 validated. WCAG compliant. Page generated in 0.1663 seconds.